Today we’re going to be covering the 2GIG GC3 Panel and answer some of the most frequently asked questions. Whether you’re a current owner or are looking to get yourself this sleek looking, top of the line panel, here are some questions you may be wondering about. #1: How do I use the duress code capability? The duress code function allows you to send an alert to the central monitoring station without alerting an intruder. If your system is armed, simply press the disarm button and enter your duress code. If your system is disarmed, simply press the logo icon and then enter your duress code. #2. I want to bookmark a screen because I always navigate there (for example: Smart Home Control screen). How do I do that? Simply pull up the screen you want to bookmark, and press the icon to the right of the message icon. You’ll then see a message that says “bookmark this screen?”. Just confirm that by pressing the OK button and you’re good to go! To pull up the bookmarked screen later, simply press the bookmark icon to the right of the message icon. #3. 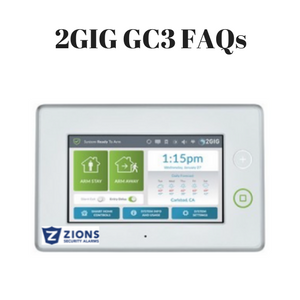 What kind of trouble alerts does the 2GIG GC3 Panel automatically check for? #4. I want to leave a window open in one of my protection zones but I want to arm the system. How do I force a bypass? If an entry point that is being monitored is open, you’ll need to put bypass that sensor. Tap the Bypass Sensors button. Find the sensor you want to bypass and slide the button on the right. #5. What does the Quick Exit function do? The Quick Exit feature allows you to exit your house while your system is already armed, without having to disarm and then rearm the system. #6. I burned some food in the oven and my fire alarm is going off, how can I turn it off? In case of a false alarm, simply enter your user code to silence it and then click on the Alarms screen to see which sensor detected it. The alarm may go off again if the sensor is still picking up smoke. If that happens, simply enter your user code and fan the detection chamber on the sensor. After you’ve addressed the issue, tap and clear the alarm history. #7. Can I use a keyfob with my 2GIG GC3 Panel? #8. What is a Scene? You can create customized scenes, or settings, based off scenarios, like “going to work,” or “waking up,” or “going to bed” to control your lights, home automation devices, and sensors. For example, you can set up a “going to bed” scene that could, depending on your equipment, lock your door, turn off your lights, and adjust the thermostat setting. #9. I want to check the serial number, Z-wave version, or firmware version. How do I do that? Tap the System Usage & Info button, then click on System info. #10. How do I add a new user to my system? This system supports up to 100 four-digit passcodes. Put your 2GIG GC3 Panel to use and enjoy all of its incredible features. Also, did we happen to miss a question you had? If so, go ahead and leave a comment below and let us know!